Love to spend some time relaxing in the water, some lakes are not as inviting after checking the facts, here’s our list of 10 of the most dangerous lakes! 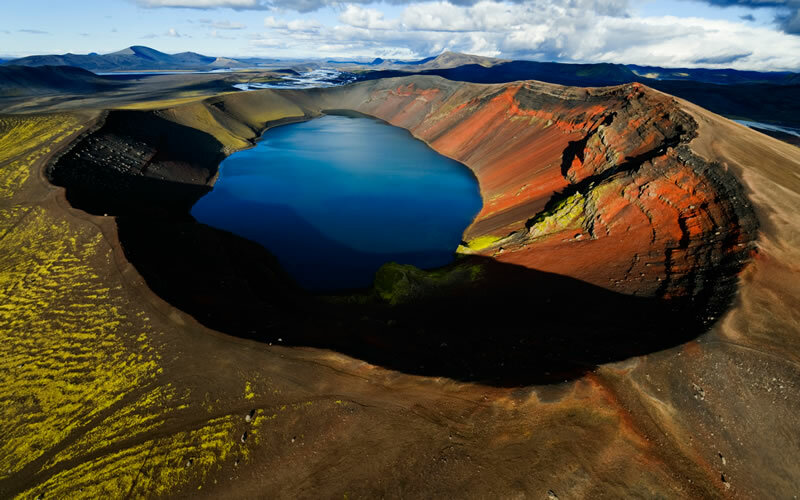 This lake in Iceland holds hundreds of millions of cubic meters of water. A catastrophic failure of the containing ice or glacial sediment can release huge volumes of this water over periods of minutes causing peak flows as high as 15,000 cubic meters per second developing an extremely turbulent and extremely fast moving torrent some 50 metres (160 ft) deep which could cause significant threats to life, property and infrastructure. 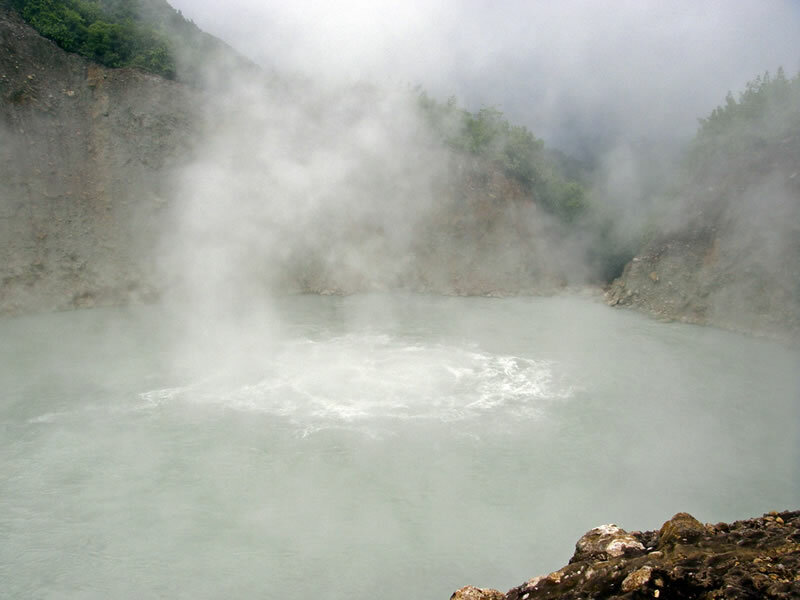 Dominica’s Boiling Lake is situated in the Morne Trois Pitons National Park and is Dominica’s World Heritage site. Filled with a bubbling greyish-blue water that is quite often enveloped in a cloud of steam and vapor. The water temperature ranges from 180–197 °F (82–92 °C) with recorded the depth to be greater than 195 feet (59 m). Situated in the Mammoth Mountain lava dome complex in Mono County, California. Massive eruptions happen here every 5000 years and so was considered harmless until 20 years ago when the the trees around the lake abruptly started to shrivel die. After ruling out disease, scientists concluded the trees were choking on excessive levels of carbon dioxide seeping up from subterranean chambers. In 2006, three people who took shelter in a nearby cave died from the high volume of carbon dioxide. Lake Karachay is a small lake in the southern Ural mountains, Russia. Since 1951 the Soviet Union used Karachay as a dumping site for radioactive waste from Mayak a nearby nuclear waste storage and reprocessing facility. It is the most polluted spot on Earth accumulating 4.44 exabecquerels (EBq) of radioactivity over less than 1 square mile of water, including 3.6 EBq of caesium-137 and 0.74 EBq of strontium-90. For comparison, the Chernobyl disaster released from 5 to 12 EBq of radioactivity over thousands of square miles. The sediment of the lake is composed almost entirely of high level radioactive waste to a depth of roughly 11 feet (3.4 m) and is sufficient to give a lethal dose to a human within 1 hour. Lake Kivu is one of the African Great Lakes situated on the border of the Democratic Republic of the Congo and Rwanda, covering a surface area of 1,040 square miles and with a maximum depth of 1,575 feet, ranked the eighteenth biggest lake in the world. Gaseous chemical compositions cause explosions of methane and carbon dioxide due to lake water interaction with a volcano. There is an estimated 65 cubic kilometers of methane and 256 cubic kilometers of carbon dioxide stored below the lake. Geological history suggests sporadic massive biological extinction on millennial timescales through the ages. Lake Michigan is the most deadly of the great lakes with several deaths each year. In summertime this warm inviting lake becomes popular for swimming and water sports but it hides massive undercurrents, dangerous rip currents and the piers and docks magnify the problem often causing death and injuries. The lake becomes most dangerous in the fall currents and waves strengthen further. Situated in Mammoth, California, Mono is one of the oldest lakes in North America being formed 760,000 years ago. Originally a saline lake with a thriving eco system which used to attract millions of birds who would feed on the trillions of brine shrimp. Unfortunately in 1941 huge quantities of water were drained from the lake over a period of 50 years turning the water into a deadly toxic alkaline lake teeming with carbonates, chlorides and sulfates. Currently The Mono Lake Committee won a legal battle that forced Los Angeles to partially restore the lake level but with hundreds of dead birds littering the shores it is evident that the lake is a long way off being healthy. Lake Monoun is situated in Western Province of Cameroon. On August 15, 1984, the lake exploded in a limnic eruption resulting in the release of a huge amount of carbon dioxide killing 37 people. Among the victims were some of the riders in a truck carrying twelve people. The truck’s engine stopped working, and the people inside the truck got out and were killed but two people sitting on top of the truck survived, because their position was elevated as carbon dioxide is heavier than air which causes it to hug the ground. Lake Nyos is a crater lake in the Northwest Region of Cameroon, very deep with high flank sides of an inactive volcano however pocket of magma lies beneath the lake and leaks carbon dioxide (CO2) into the water, changing it into carbonic acid making it one of only three known exploding lakes to be saturated with carbon dioxide. On August 21, 1986 as the result of a landslide the Lake emitted an immense cloud of CO2 suffocating 1,700 people and 3,500 livestock in local towns and villages. Lake of the Ozarks is ranked the most dangerous lake in the United States and the third deadliest body of water only being overtaken by the Atlantic ocean and the Colorado river. There are several factors making this lake so dangerous ranging from elevated ecoli levels due to raw sewage being dumped in the lake, lack of policing, careless dock wiring and careless racing boats and cruises who like to use top speeds combined with too much alcohol creating mindless accidents and deaths. around 50 deaths occur each year and around 70% of those involve alcohol.